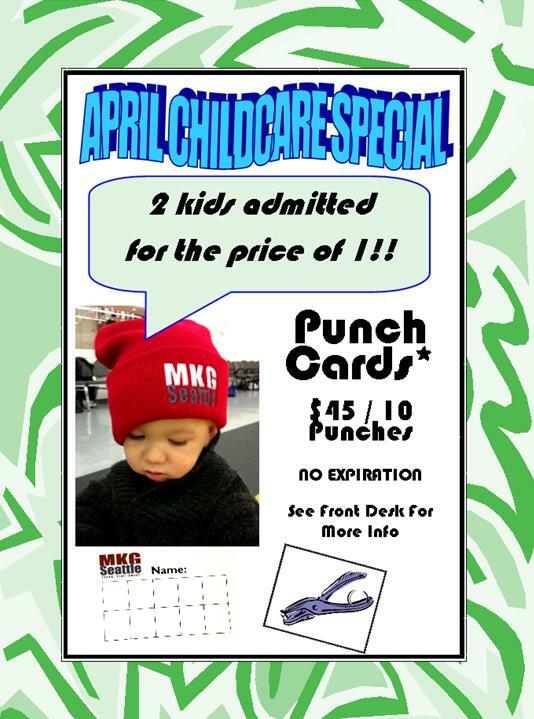 Many people are not aware that the MKG Seattle community has an affordable Child Care option for all of our students. Whether you are in our Adult Martial Arts / Kickboxing, MAX10 Boot Camp or CrossFit MKG program you are eligible to use our Child Card program. As new parents themselves, the owners of MKG understand how difficult it is to make time for yourself and it is for this reason they are committed to providing some allotted times each week where one of our Child Care staff members can watch your kids for up to two hours while you train. We have a dedicated space, toys, wi-fi and study area in addition to a dedicated staff member for supervision. During the month of April we are having a special if you have more than one child. 2 Kids admitted for the price of 1!!! Remember our fee is only $5.00 a class anyway! A steal! Give us a call at our main number of 206-789-2411 with any questions. This entry was posted in News & Events by mkgmaxfitness. Bookmark the permalink.